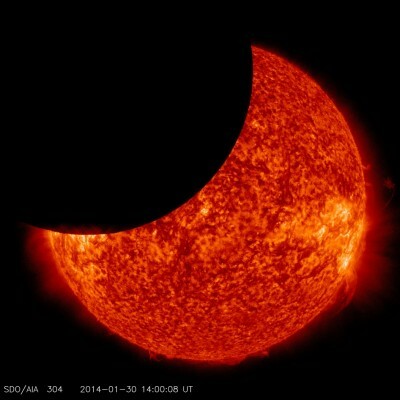 On Jan. 30, 2014, beginning at 8:31 a.m EST, the moon moved between NASA’s Solar Dynamics Observatory, or SDO, and the sun, giving the observatory a view of a partial solar eclipse from space. Such a lunar transit happens two to three times each year. This one lasted two and one half hours, which is the longest ever recorded. When the next one will occur is as of yet unknown due to planned adjustments in SDO’s orbit.